Long-term breast cancer survivors are women surviving at least 5 years after diagnosis. This systematic review aimed to summarize the main characteristics and patterns of healthcare service use (frequency of visits, health providers visited, and preventive care performed) among long-term breast cancer survivors. We used standard Cochrane Collaboration methods and searched the MEDLINE and EMBASE databases up to January 2018. We included English language observational studies reporting health service use among long-term cancer survivors. The quality of the studies was appraised through the ROBINS-I assessment tool. Two independent reviewers performed both the study quality assessment and the data extraction. A total of 23 observational studies were included that reported data on health services use by long-term breast cancer survivors. Despite heterogeneity among studies, about half of them reported that breast cancer survivors visited a medical provider at least once a year, as recommended by breast cancer survival guidelines. Although survivors visited medical providers with the recommended frequency, a substantial number used specialist care instead of primary care during follow-up. The results showed underuse of the recommended annual mammogram. Long-term breast cancer survivors differ in their health services use with regard to the frequency of visits as well as the health providers seen. Our results indicate the need for active surveillance through primary care providers in coordination with specialized care. This review could help to standardize the management of breast cancer survivors and decision-makers to adapt their guidelines and clinical protocols. The online version of this article ( https://doi.org/10.1007/s11764-019-00755-z) contains supplementary material, which is available to authorized users. Long-term breast cancer survivors are those women who survive free from cancer recurrence or new primary cancer for at least 5 years . It is well-known that survival has increased in women with breast cancer, particularly in European countries as well as in the USA, and trends suggest that it will keep increasing. Recent data from the NORDCAN Project show that around 87% of women diagnosed with breast cancer in the Nordic countries will live disease-free for at least 5 years and 74–83% for at least 10 years , which is slightly higher than in the rest of Europe. In the USA, the 5-year relative survival rate for all types of breast cancer was 90% in 2014 . In 2011, the survival rate for breast cancer ranked fifth for all cancers and third when analyzing only women . The increased likelihood of survival can be explained by numerous factors, such as improvements in breast cancer screening and advances in diagnosis and treatment and aging [5, 6]. Due to the increase in survivorship rates and life expectancy among breast cancer survivors, the pool of long-term breast cancer survivors is likely to expand considerably in the coming decades [7, 8, 9, 10]. Cancer survivors’ follow-up is an essential phase of cancer care and includes surveillance, symptom control interventions, comorbidities, and complications treatment, as well as psychosocial needs and care coordination mechanisms. This is usually performed by both the primary care providers (GP, nurses, social workers) and the specialized attention (medical oncologist, radiation oncologist, gynecologists, physiotherapist, psychologist) [8, 11, 12]. The critical point in survival care appears after the discharge from oncology or specialist care, when these women remain at long-term risk of complications due to treatment and the risk of relapses . However, it is not clear whether women who have received cancer therapy are more likely to develop other comorbidities than those without a history of cancer . Because of this, it is essential that breast cancer survivors, besides breast cancer specific prevention, receive the standardized preventive care as the women without cancer history. Furthermore, clear guidelines are needed to assist decision-making on health care planning and follow-up in this group of women and to improve the efficiency of primary care officers . The National Cancer Institute from USA sets among their six priorities, for cancer-related public health research, to study how to meet the needs and challenges of a growing population of cancer survivors . It is essential to provide evidence on how health systems should answer to the long-term survivors’ follow-up. The use of healthcare services by breast cancer survivors presents new challenges for health organizations in terms of the role of every health professional and the characteristics and frequency of visits and tests performed. While there are many evidence-based guidelines for diagnosis and treatment, there are far fewer for long-term survivorship follow-up [16, 17, 18] and, particularly, there is little evidence on the type of follow-up and health needs of this population group [17, 18, 19, 20, 21, 22, 23]. Evidence synthesis methods are an excellent alternative for decision-makers to assess the scope, quality, and relevance of available data and to identify areas of clinical uncertainty and gaps in available scientific information. This systematic review aimed to describe the main characteristics and patterns of healthcare services use (frequency of visits, health providers visited, and preventive care performed) among long-term breast cancer survivors. This systematic review was conducted following standard Cochrane Collaboration methods  with a predetermined review protocol registered in the PROSPERO database (CRD42018089309). We searched MEDLINE and EMBASE databases from their inception to 24 January 2018, following the PRISMA statement , to obtain all the existing literature on health services use and preventive care in long-term breast cancer survivors. Health services use was assessed through the frequency of visits to primary care providers, specialists and other health professionals, and the main reason to visit. Preventive care included all tests performed in women designed to identify a new incident cancer or relapse and all the surveillance tests for cancer-related reasons or not. The search strategy included a combination of controlled vocabulary and search terms related to long-term breast cancer survivors and health services use, such as breast cancer, cancer survivor, survivorship, health services use, health care utilization, general practitioner, specialist, and follow-up care. The search strategy can be found in Appendix A. Stage I screening identified titles and abstracts related to the main objective and was done by two independent reviewers. Stage 2 screened the full-text articles against the inclusion and exclusion criteria, described below. Articles meeting the inclusion criteria were included in the synthesis; this phase was also conducted by two reviewers. In all cases, agreement was reached after discussion of any differences. The results of this process are reported in a PRISMA flowchart (Fig. 1). Inclusion was limited to observational studies written in English. Systematic reviews were used as the source of primary studies. The included studies were published between 2006 and January 2018. Studies reporting the frequency of health care use in long-term breast cancer survivors, defined as the period starting 5 years after diagnosis, were included. We excluded narrative reviews, conference abstracts, recommendations, summary reports, and editorials. Studies not providing detailed information by survival period (at least 5 years after diagnosis) were excluded, as were studies about cancer in general that did not provide results for breast cancer specifically. Studies published before 2005 were excluded, as the treatment for breast cancer changed then because of the introduction of trastuzumab therapy. Treatment with this trastuzumab in HER2-positive tumors at an early stage improved overall survival and disease-free survival . Lastly, studies aiming to analyze patients’ and health care providers’ satisfactions with healthcare were also excluded unless they reported data on health services use. We developed a predefined form to extract information from included studies. The following information was selected: author, country, year of publication, study design, purpose, population characteristics, survival period, type of analysis, results by outcomes (health services use and preventive care), data source, and study limitations. Two reviewers independently extracted the data for the included studies. Disagreements between them were resolved by consensus. To assess the methodological quality of the studies, we used the Risk of Bias in Non-randomized Studies of Interventions (ROBINS-I) assessment tool . The following sources of bias were assessed: (i) bias due to confounding, (ii) bias in the selection of participants into the study, (iii) bias due to missing data, (iv) bias in measurement of outcomes, (v) bias in the selection of the reported result, and (vi) overall bias. For each study, the risk of bias for each domain was rated as low risk of bias, moderate risk of bias, serious risk of bias, critical risk of bias, or no information. The final risk of bias assessment was based on consensus by two reviewers following the ROBINS guidelines  and was considered in the interpretation of the results. There was wide heterogeneity across study populations and diversity in the categories of survivor follow-up among the studies. This and the way the results were analyzed and presented in the studies precluded the possibility of pooling the data across studies. Therefore, we performed a narrative synthesis with tabulation of the characteristics and main outcomes of the included studies. The studies are ordered according to study design in the tables as follows: retrospective cohort with a control group, retrospective cohort without a control group, and cross-sectional studies. A total of 1089 abstracts were eligible for title and abstract screening, and 61 were checked at the full-text reading. Twenty-three observational studies met the eligibility criteria and were included in the final review. Of them, 12 (52.2%) were retrospective cohort studies without a control group, 6 (26.1%) were retrospective cohort studies with a control group, and 5 (21.7%) were cross-sectional studies. The publication period ranged from 2005 to 2018, and 9 studies (39%) were conducted in the USA, 11 (48%) in Europe, of which 3 (13%) were from the UK. The data source was tumor registries or hospital databases in 12 (52.2%) of the included studies, self-reported surveys or interviews in 9 (39.1%) studies, and 2 (8.7%) used both sources. The 23 studies involved 476,127 women aged 18 years or older with different parameters (Table 2). The period of breast cancer diagnosis varied from 1989 [34, 47] to 2013 [44, 46]. In terms of location, eight studies (34.8%) included populations from both urban and rural areas, and 3 (13%) included only urban areas, while 12 (52.2%) did not report characteristics regarding location. To assess comorbidities during follow-up, 4 (17.4%) of the 23 articles used the Charlson comorbidity index, 6 (26.1%) did not report information about comorbidities, and the rest included a list of different diseases associated with breast cancer treatment. More details on comorbidities are shown in Table 1. The range of reported survival periods differed among all the studies, even though all of them included survival of at least 5 years or more. Lu et al. included the longest follow-up period (16 years from diagnosis), followed by the studies by Maddams et al. and Weaver et al. with 16 and 14 years of follow-up, respectively. To summarize the outcomes, we performed a tabulation of the given measures and risk estimators (Table 2). A total of 10 (44%) studies described both healthcare use and preventive care, 9 (39%) described healthcare utilization, and 4 (17%) described preventive health practices. No differences were found in terms of reported outcomes by country. No. of visits per patient per year: 0.98 visits in primary care (SD 0.48) and 1.11 in specialist care (SD 0.38). Scheduled visits accounted for 44.6% of visits to primary care and 94.6% of those to specialist care (p = 0.19). The mean number of visits per patient and year due to mammograms was 0.80 (0.40) in primary care and 0.92 (0.27) in specialist care. The probability of an outpatient specialist office visit was 11.8% higher in patients surviving 6–10 years and 14% higher for those surviving 11 years or more after their cancer diagnosis than in respondents with no history of cancer. The average marginal effect of having a primary care physician visit at 5–10 years after diagnosis was 0.049(p > 0.05) while that of having an outpatient visit was 0.118 (p < 0.01). A decrease was found after the 11th year as the average marginal effect of having a primary care physician visit was 0.030(p > 0.05) and that of an outpatient visit was 0.140 (p < 0.001). BC survivors were 3.49 (2.55–4.79) times more likely to visit a gynecologist and 2.21 (1.73–2.82) times more likely to visit a family physician/internist than other types of health professional. In the 5th year, only 63% had mammograms. Women aged 75 years or older with higher levels of comorbidity were significantly less likely to have mammograms (OR = 0.35, 95% CI 0.23–0.52). The strongest predictor was outpatient visits to a gynecologist (OR = 3.49, 95% CI 2.55–4.79) or a primary care physician (OR = 2.21, 95% CI 1.73–2.82). There were no significant differences among the odds for flu shot (OR = 1.43, 95% CI 0.76–2.67), PAP (OR = 0.98, 95% CI 0.60–1.62) or general physician exam (OR = 1.07, 95% CI 0.46–1.34). No significant differences were observed (p > 0.065) between 5- and 10-year survivors. BC survivors reported follow-up visits, mainly to the oncologist and were those who reported most visits (p > 0.001); 18.9% had a visit for cancer-related morbidity and 71.5% for non-cancer-related morbidity. A primary care physician was seen by patients needing medical care related to cancer in the last 12 months (38.5%). In visits not related to cancer morbidity, the primary care physician was also the main health professional visited (72.8%). Life expectancy was 5 or more years in 8.6% and 10 or more years in 35%. 94.2% reported visiting a primary care physician in the last 12 months and 5.8% a specialist. Of those who had a mammogram, 79.1% visited their primary care physician in the last 12 months and 75% visited specialist care. A lower life expectancy (mortality risk > 50%) remained significantly associated with lower odds of surveillance mammography in the last 12 months (OR [5 years life expectancy] = 0.4, 95% CI 0.3–0.8). Women with more than 6 visits to the health services in the last 12 months had twice the likelihood of undergoing a surveillance mammogram (OR = 2.1, 95% CI 1.3–3.4). The adjusted OR of using a yearly mammography and/or clinical breast exam in women older than 75 years old was OR = 0.16, 95% CI 0.10–0.24 and was OR = 0.45, 95% CI 0.29–0.71 while in women aged 65–74 years. The average number of visits diminished over time (1.9 in year 5) except in patients aged 80 years or more. Most women saw both an oncologist and a primary care provider but this diminished over time. BC survivors were more likely to have a bone density scan (OR = 1.26, 95% CI 1.10–1.44), influenza vaccination (OR = 1.15, 95% CI 1.07–1.23) and a cervical smear (OR = 1.14, 95% CI 1.03–1.25) than controls. Slight increase in the overall number of consultations among BC (IRR = 1.11, 95% CI 1.09–1.12) vs controls. BC and colorectal cancer survivors had higher rates of primary care physician consultations in the first 10 years after diagnosis. In the 5th year, survivors, made a mean number of 2.3 visits (SD 3.3) to an oncologist, 2 visits (SD 1.6) to a surgeon and 4.6 visits to a PCP (SD 4.9). In adjusted models, BC survivors had an OR = 1.15, 95% CI 1.09–1.21 for CRC screening, OR = 3.59, 95% CI 3.26–3.96 for PAP, OR = 0.84, 95% CI 0.80–0.89 for lipid profile and OR = 1.53 95% CI 1.42–1.65 for bone densitometry. Long-term hospital visits decreased over time. After the 5th year, the average number of visits was 1 per year. Women diagnosed after the age of 70 years were less likely to underuse hospital follow-up (OR 0.64, 95% CI 0.42–0.96). The opposite was found for those women who survived 6 to 10 years after primary treatment (OR 2.86, 95% CI 2.26–3.62). The mean number of days spent in hospital for a cancer-related reason was 0.4 at 5 years since diagnosis and 0.3 at 16 years. For non-cancer-related conditions, this number was 0.5 at 5 years and 0.2 at 16 years. 74% of BC survivors saw a primary care physician in the last 12 month, 49% saw a specialist physician in a hospital, 18% saw a physical therapist/chiropractor, and 8% used complementary and alternative medicine. The percentage of visits to primary care did not decrease annually. During the 6th to 12th years since diagnosis, 54% of BC survivors saw a cancer specialist (45.6% hematologist/oncologist, 11.3% radiation oncologist) and 19.9% saw a cancer-related specialist. 76% saw a primary care provider and 70.7% a medical specialist. 68.5% indicated their main provider for after-cancer care was an oncologist. 51% of BC survivors had at least 1 routine follow-up visit. In terms of follow-up group, 49% had 0 visits and 21.2% had 5 or more. Use of surveillance mammography declined through year 6 and became stable from year 7 to 10 (the median number of surveillance mammograms over the 10 years follow-up was 4). Women with outpatient visits to primary care providers, an oncologist, or both had higher odds for undergoing surveillance than women seeing neither type of provider: [OR(oncologist only) = 1.55, 95% CI 1.16–2.08, OR(PCP only) = 1.33, 95% CI 1.11–1.59, OR(both) = 1.87, 95% CI 1.56–2.25]. 49% of BC survivors reported taking calcium supplements, 6.1% reported taking vitamin D supplements and 27% reported having a bone density scan since being diagnosed with BC. BC survivors were more in contact with medical specialists, outpatient clinics, physiotherapists, chiropractors and “other doctor” in the last 3 months than the general population (SRR = 1.10, 95% CI 1.05–1.15). The proportion of BC survivors who visited a specialist was higher than in general population (53%; p < 0.001). Young BC survivors more often visited a physical therapist (56%; p < 0.01 vs 29%) and a complementary caregiver (26%; p < 0.05 vs 13%). Women with a higher well-being score contacted specialists less. 32% of BC survivors did not receive follow-up visits in the past 2 years. In 64%, the main follow-up care physician was the oncologist or a cancer-related specialist. Activities associated with preventive care were commonly reported: 76.8% of the follow-up visits were due to screening for other cancers and 35.5% for non-cancer screening tests. 77.8% of patients reported having had a routine check-up in the last year with their primary care physician and 77.8% reported receiving cancer follow-up instructions after cancer treatment. 75% reported that their primary care provider was the clinician most frequently providing care. The < 6-year BC survivors were less likely to report a cancer-related clinician as the clinician who provided most of the care compared with the women diagnosed in the last 3 years or less: OR (2–3 years) = 2.55, 95% CI 1.43–4.55; OR (4–5 years) = 1.68, 95% CI 0.93–3.06. There are nationally recommended follow-up guidelines for BC survivors but the type of clinician that should provide care is not specified. Eleven studies reported that breast cancer survivors visited a primary care provider or a specialist at least once a year [28, 32, 33, 35, 37, 38, 39, 41, 44, 46, 50]. Some studies reported more visits to specialist care, such as an oncologist, surgeon, radiotherapist, gynecologist, or other specialist [28, 32, 49], while another three studies reported more visits to primary care physicians than to specialist care [35, 37, 38]. No differences were found between the studies reporting more visits to specialized attention compared to those reporting more to primary care in terms of country, publication period, years of follow-up, period of diagnosis, or data source. Another study reported that 58.8% of the patients used complementary therapies after treatment completion . Regarding the reason for consultation, two studies agreed that the main reason for breast cancer survivors visiting the health services was non-cancer-related issues and that the medical provider most frequently consulted for these health problems was the primary care provider [32, 42]. In four studies, the predictors of health services use were lower well-being score, having had a mastectomy, having two or more comorbidities, having a painful arm, and younger age [34, 39, 43, 48]. Even so, only two of these studies analyzed both primary care and specialized attention [43, 48] and attributed the highest use to comorbidities management in younger survivors. In contrast, one study showed that the oldest survivors (> 70 years) had twice the probability of visiting a physician in the last 3 months rather than their younger counterparts. Nevertheless, that study did not adjust by comorbidities and was focused only in the specialized attention without taking into account the use of health services related with age and preventive care . In terms of the trends in long-term use, three studies showed that the average number of visits decreased over time [29, 35, 49], but other studies did not find similar results  or found that this decrease occurred only in specialist care but not in primary care physician visits . However, only two studies included age-adjusted models [30, 49]. Five studies compared health services use between survivors and the general population. The likelihood of using the health services in breast cancer survivors compared to the general population ranged from 1.1 (95% CI 1.09–1.12)  to 1.48 (95% CI 1.34–1.64) . Two studies agreed that this increase occurred only in specialist care [31, 36] and in the use of complementary therapies . The percentages of breast cancer survivors using complementary therapies was 26% in 10-year survivors and 13% in their matched controls . Mammograms were the most widely studied preventive activity in this population. Mixed results were found in its utilization. Two study showed that mammography screening was performed according to the guidelines in breast cancer survivors (once a year from the fifth year of survivorship) [28, 31], while other four studies found underutilization regarding the annual mammography screening recommended for breast cancer survivors [35, 39, 43, 45]. Two studies reported that screening mammography was more likely to be performed in breast cancer survivors than in controls. It should be noticed that recommendations for the two populations differ [31, 43]. The main predictor for mammography use was visits to the health services [28, 43, 45]. Specifically, mammography is more frequently recommended by oncologists rather than by primary care providers or other health specialists [28, 43]. Being older with high levels of comorbidities was associated with a lower probability of undergoing mammography [30, 31, 33, 35, 47]. Five studies [30, 38, 43, 46] evaluated imaging scans. More imaging tests were reported in breast cancer survivors rather than in the general population, specifically bone density scans [31, 36, 38]. In addition, those women whose main medical provider was an oncologist were more likely to undergo additional imaging scans . In terms of general preventive activities, breast cancer survivors were more likely to receive appropriate preventive screening than controls for both cancer and non-cancer screening [31, 38, 49]. Another study found similar results but pointed out that when the main medical provider was the oncologist, breast cancer survivors received additional surveillance tests not recommended by the guidelines [28, 43, 49]. Quality assessment revealed that around 90% of the included studies showed an overall low risk of bias and only 10% were at high risk. Specifically, four (17.4%) of studies were at high risk of bias due to confounding. The higher risk was due to not considering the predefined potential confounders (age at diagnosis, the presence of comorbidities, region, diagnostic year, and tumor stage at diagnosis). In addition, four (17.4%) of studies were also at high risk of bias due to outcome measurement. In this group, three of the studies at serious risk used self-reported information. Three studies were at high risk of bias due to participant selection and missing data and reported results. 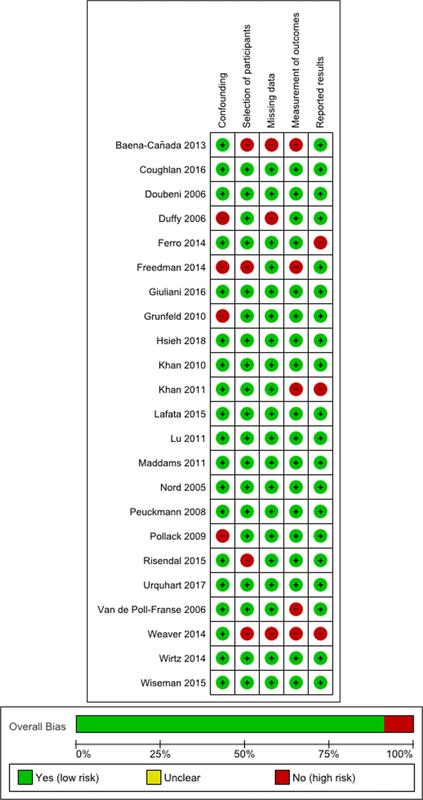 The quality appraisal of all the included studies is shown in Fig. 2. 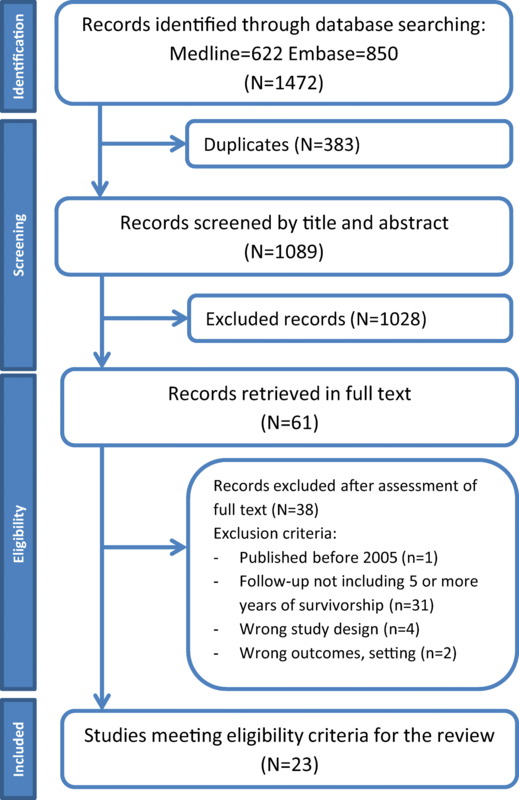 This systematic review aimed to describe the use of health services in long-term (≥ 5 years) breast cancer survivors. A total of 23 observational studies were included that reported data on the health services used by women surviving at least 5 years after their breast cancer diagnosis. Despite the heterogeneity among studies, about half of them reported that breast cancer survivors visit a medical provider at least once a year but that their main medical provider was not a primary healthcare professional, as recommended in the breast cancer survival guidelines [16, 17, 18]. In addition, some studies suggested that the number of visits to healthcare services and interventions decreased over time. Results on preventive care were contradictory, with some studies reporting overuse of surveillance tests [33, 35, 43] and others underuse [31, 39, 46]. However, the studies differed in how they assessed the frequency of the use of preventive care, hampering clear conclusions on the current situation in breast cancer survivors. No previous systematic reviews were found describing health services use in long-term breast cancer survivors (≥ 5 years). The review by Chopra provides useful information about patterns of health care services use but was not based on long-term survivors . Like our results, those of that review showed substantial variations in terms of the frequency, length, and intensity of follow-up. The authors concluded that breast cancer survivors report a lack of psychosocial support and information on the comorbidities resulting from their cancer treatment. 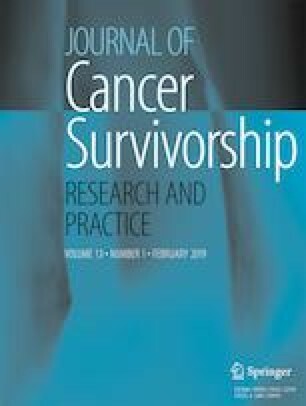 Regarding the frequency of health services use, 10 studies included in this systematic review [28, 33, 35, 37, 38, 39, 41, 42, 47, 50] showed results in agreement with the breast cancer Survivorship Care Guidelines as they reported that breast cancer survivors visited a healthcare provider at least once a year [16, 17, 18]. These guidelines also recommend that from the fifth year after the completion of cancer treatment, the primary care clinician should be the professional in charge of breast cancer survivors’ health. We found, however, that only 6 out of 10 studies reported more visits to primary care clinicians than to specialized care [33, 35, 37, 38, 50]. Several factors support the idea of increasing and encouraging primary care utilization. One is that it facilitates coordinated care and reduces specialist visits . Primary care as the axis of prevention and health promotion activities also provides a holistic approach, guaranteeing better coverage of all the recommended preventive activities [16, 17, 18]. Health providers in specialized care, on the other hand, are less aware of the preventive recommendations in this population, but they still have to provide these recommendations and receive appropriate training regarding survival care. Although these 10 studies were conducted in different countries, most of them were deemed to be of moderate or high quality. Also, they reported similar results, and therefore, there is sufficient evidence to support the recommendation of 1-year follow-up visits performed by primary care officers. Watson et al. reported that health promotion advice helps to mitigate the long-term effects of breast cancer, improve comorbid conditions, and potentially increase survival. In agreement with these authors, eight studies included in this review reported similar results in breast cancer survivors [31, 36, 38, 41, 45, 46, 48, 49]. In addition, three of them [35, 44, 49] stated that breast cancer survivors were more satisfied when the health promotion advice was given by primary health professionals. Overall, the available evidence indicates that primary healthcare providers should place greater emphasis on post-treatment symptoms to make patients aware of them and provide advice on their management. To do this, the best option seems to be the shared care model since it can facilitate a continued relationship in terms of updates and changes in surveillance recommendations and potential late effects [53, 54]. Primary care clinicians should consult with the cancer treatment team to ensure evidence-based and well-coordinated care. Surveillance mammography has been recommended for both the early detection of local recurrences as well as the screening of de novo primary breast cancer [16, 17, 18]. The results of our review suggest that improvements should be made to increase adherence to this recommendation given that underuse of mammography has been described in four high-quality studies [30, 35, 39, 45]. Furthermore, our results suggest that clinicians should refer women for an annual mammogram rather than to other screening strategies, unless the patient is at high risk of developing de novo cancer or recurrence [16, 17, 18]. Heterogeneity in adherence to mammography as a recommended surveillance test can be due to national screening policies, professional decisions, or structural barriers. Thus, efforts need to be made to ensure an annual mammogram in long-term survivors and avoid losses to follow-up [55, 56]. In terms of other preventive care, the results of two high-quality studies included [31, 43] show that laboratory tests and imaging scans are more frequent in breast cancer survivors than in the general population, probably related to comorbidities and surveillance of cancer recurrence surveillance. According to expert opinion, routine laboratory or imaging tests to evaluate breast cancer recurrence are not recommended in asymptomatic patients, while screening for other cancers and preventive diseases should be done as in patients in the general population [16, 17, 18]. These results support active surveillance through primary care medical providers in coordination with specialized care for the correct management of comorbidities and to raise awareness of the appropriate prescription of laboratory tests and imaging scans. This review has some limitations. Some studies used self-reported information on health services use and in the identification of breast cancer survivors [28, 29, 32, 33, 36, 41, 44, 48, 49, 50]. This could lead to a reporting bias, specifically a memory bias, which tends to overestimate or underestimate outcomes in survivors. Other limitations are the differences between the populations, survival periods, age at diagnosis, and year of diagnosis included in each study. All studies included survivors of 5 years or more, but the periods were not restricted at any point, so the survival periods ranged from 5 to 16 years. We could not analyze the differences between longer and shorter survivorship, which could also help to develop specific protocols. Survival can lead to a selection bias, since longer survival is related to better quality of life [39, 41, 44, 49, 50] and consequently to fewer visits to health services. Advances in breast cancer treatment need to be taken into account, as some women included in this review did not receive the most recent therapies and might have experienced an increased number of adverse effects or shown a different pattern of health services use related to updating of survival guidelines. Finally, we found no RCTs that tested interventions in breast cancer survivors regarding the management of long-term late effects and comorbidities due to cancer treatment. This is the first systematic review to include long-term breast cancer survivors (at least 5 years of survivorship), revealing heterogeneity in follow-up activities and areas for improvement. Further research with mixed methodology is needed to identify the sources of the variations, professionals’ perceptions, and patients’ needs. Such knowledge would generate opportunities to mitigate current barriers to health services and to structure shared follow-up models. The literature on the use of health care services among long-term breast cancer survivors shows substantial heterogeneity in methods to evaluate the follow-up characteristics in this specific population. The results of this review help to support the need for actions to improve active surveillance through primary care providers in coordination with specialized care through shared care models of follow-up. Furthermore, this approach can be strongly recommended due to the high quality of the studies in favor of the latter. Our results could also help to standardize the appropriate management of breast cancer survivors and decision-makers in different contexts to adapt their guidelines and clinical protocols. More research is still needed to provide specific data, but this review helps to support primary care providers as the main health providers for this group of women with particular needs. Anna Jansana is a Ph.D. candidate at the Methodology of Biomedical Research and Public Health program, Universitat Autònoma de Barcelona (UAB), Barcelona, Spain. Hospital del Mar Medical Research Institute (IMIM), Barcelona: Mercè Abizanda, Mercè Comas, Laia Domingo, Talita Duarte, Anna Jansana, Javier Louro, Maria Sala. Hospital Costa del Sol, University of Málaga: María del Carmen Martínez, Cristóbal Molina, María del Carmen Padilla, Maximino Redondo. EpiChron Group of Chronic Disease Research, Zaragoza: Antonio Gimeno, Manuela Lanzuela, Beatriz Poblador, Alexandra Prados. Primary Care Research Unit. Gerencia de Atención Primaria, Madrid: Ángel Alberquilla, Isabel del Cura, Antonio Díaz, Teresa Sanz. Miguel Servet Health services and Cronicity Research Group, Navarra: Javier Baquedano, Rosana Burgui, Berta Ibáñez, María Concepción Moreno. This study was funded by the Carlos III Health Institute through the project “PI16/0024” and “PI15/00098”and co-funded by FEDER (European Regional Development Fund/European Social Fund), and by the Research Network on Health Services in Chronic Diseases-REDISSEC (RD16/0001/0013). The authors declare that they have no conflict of interest. This protocol is registered in PROSPERO (2018:CRD42018089309). Noone A, Howlader N, Krapcho M, Miller D, Brest A, Yu M, Ruhl J, SEER Cancer Statistics Review, et al., 1975-2015. National Cancer Institute. Bethesda. Available at: https://seer.cancer.gov/csr/1975_2015/. Accessed 21 Feb 2019. Cancer Research UK. Breast cancer survival statistics. Available at: https://www.cancerresearchuk.org/. Accessed 20 Feb 2018. Surveillance, Epidemiology, and End Results (SEER) Program. SEERStat Database: Incidence-SEER-9 regulations. National Cancer Institute, Division of Cancer Control and Population Sciences. Bethesda: 2003. Available at: https://seer.cancer.gov/ Accessed July 20, 2018. Boekel NB, Schaapveld M, Gietema JA, et al. Cardiovascular morbidity and mortality after treatment for ductal carcinoma in situ of the breast. J Natl Cancer Inst. 2014;106(8). https://doi.org/10.1093/jnci/dju156. National Cancer Institute. Public Health Research and Cancer. Bethesda. Available at: https://www.cancer.gov/research/areas/public-health#opportunities. Accessed 25 Jan 2019. Alba E, Cruz J, Barón F, Rodríguez X, Blasco A, Escobar Y, et al. Monográfico SEOM de largos supervivientes en cáncer. Madrid: Sociedad Española de Oncología Médica; 2012. Available at: https://seom.org/seomcms/images/stories/recursos/infopublico/publicaciones/MONOGRAFICO_SEOM_LARGOS_SUPERVIVIENTES_I.pdf. Accessed 20 April 2018. Sterne J, Hernán M, Reeves B, Savović J, Berkman N, Viswanathan M, et al. ROBINS-I: a tool for assessing risk of bias in non-randomised studies of interventions. BMJ. 2016;355. https://doi.org/10.1136/bmj.i4919. Barnadas A, Algara M, Córdoba O, Casas A, Gonzalez M, López T, et al. Recomendaciones para el seguimiento de las mujeres supervivientes de cáncer de mama. Sociedad Española de Oncología Médica. 2017. Available at: http://sespm.es/archivos/Recomendaciones-para-Seguimiento-de-las-Mujeres-Supervivientes-Cancer-de-Mama.pdf. Accessed 18 May 2018.